Hello! I have to say it feels good to be back after a bit of a break over the holidays! It was a busy holiday season for everyone I'm sure. 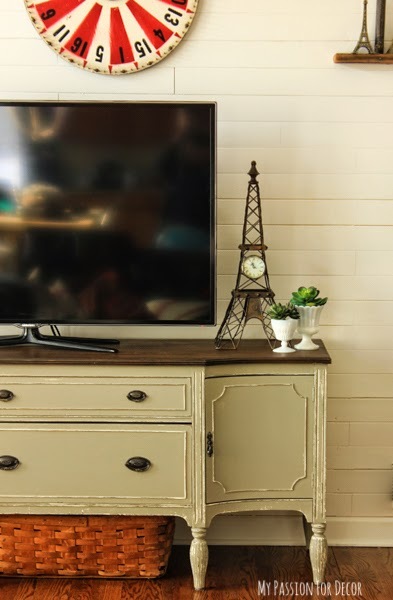 I got a lot done over the break and I thought I'd start with one of my favorites....my media cabinet update. 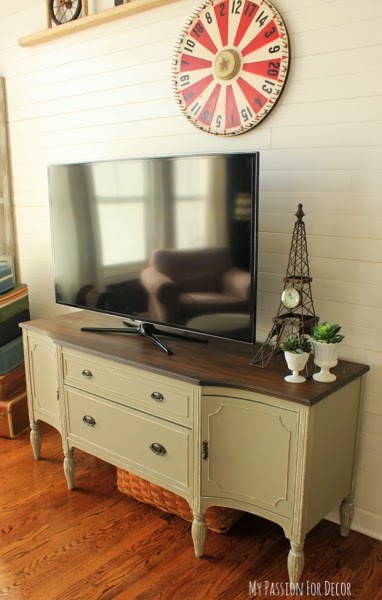 Craigslist buffet turned media cabinet. In case you don't remember, this is what the cabinet looked like when I purchased it almost 3 years ago (BTW I can't believe it's been that long!). The piece had a lot of issues, missing pieces, peeling veneer and tons of scratches. I stained the top dark and painted the rest a nice bright white and I loved it!! Here's a picture of the piece right after I finished. 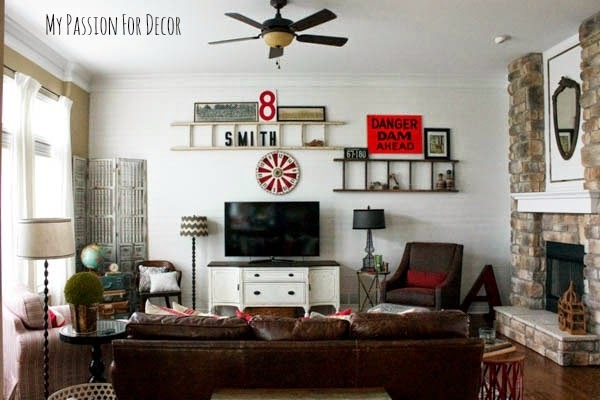 It's fun to see how things have evolved and changed in my decor, etc over 3 moves and 3 years! Fast forward almost 2 years and this is how the cabinet looked in our new home not long after we moved in. This was my temporary solution to a huge monolithic wall before I completed the plank wall project. Fast forward again, a few months later and this is what the room looked like. As much as I LOVED the white plank wall, I didn't like how the white cabinet got a bit lost in all the white. 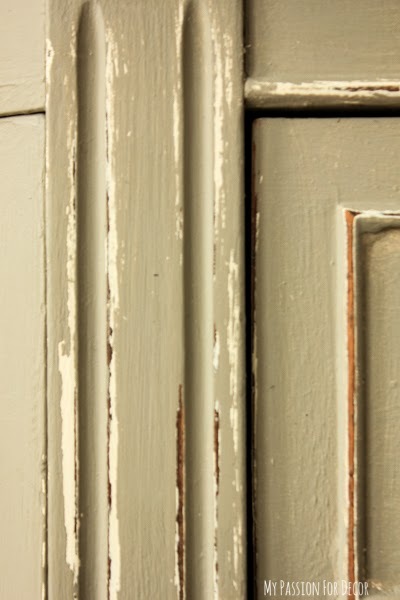 This wasn't a huge priority, but one day I decided it would be an easy fix to paint the cabinet and that's exactly what I did!! 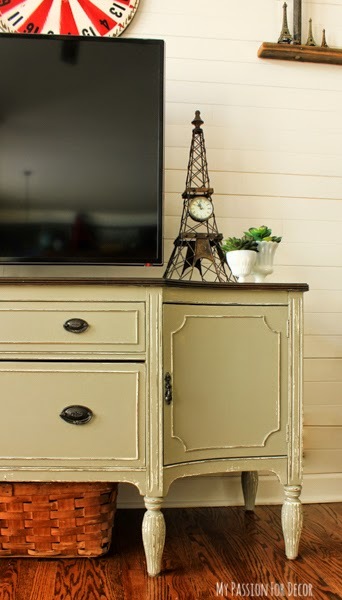 I painted the media cabinet base in French Linen Chalk Paint™ decorative paint by Annie Sloan . This project only took me about 2 1/2 hours from start to finish and the impact was well worth the minimal time and effort. The only thing I had to do was take out the drawers and remove the hardware and paint over the existing paint and wax finish. To protect the hardwood floors I simply put wax paper under each leg. Here's what our media cabinet looks like now. Before I waxed the piece, I took a wet cloth and wiped back the paint in a few spots so the white could show through for some contrast. 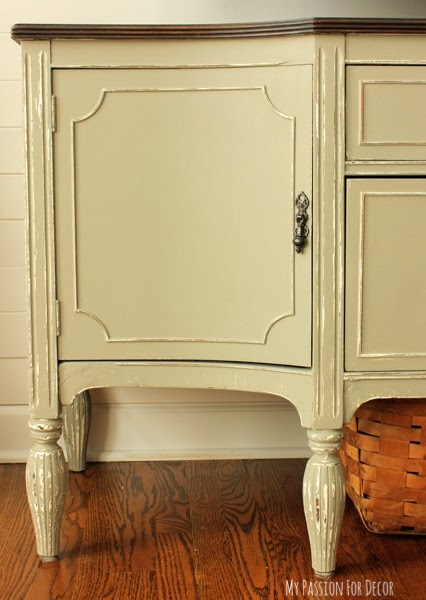 I sealed the French Linen Chalk Paint™with a coat of Annie Sloan soft wax in clear, then buffed. 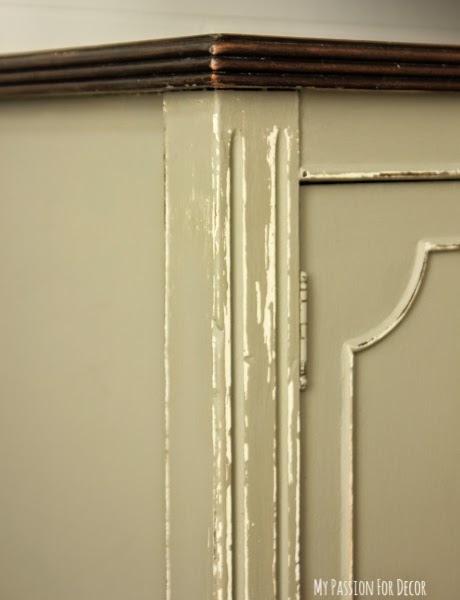 I think a lot of people who haven't used Chalk Paint™ don't understand the purpose of waxing. The wax actually penetrates the paint which protects and seals the painted finish. The surface of the paint goes from feeling chalky (where the paint got its name...there's no actual chalk in the paint) to smooth after excess wax is removed and buffed with a lint free cloth. In this picture you can see where I wiped back the paint to reveal the white underneath. 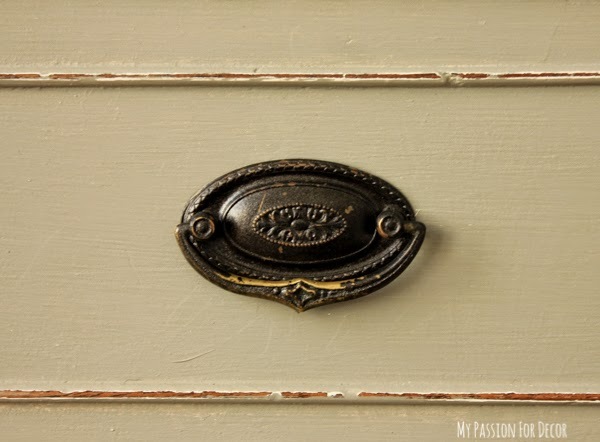 I could have re-sprayed the hardware with a new coat of oil rubbed bronze paint, but I liked the distressed look of the brass showing through so I left them alone. 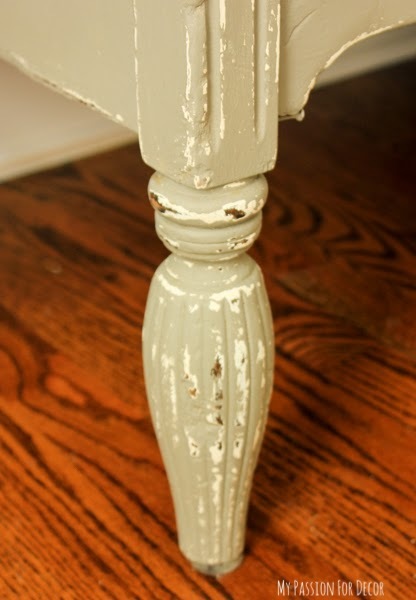 I like how the wood and the white paint show through and age some character to the great details on this piece. 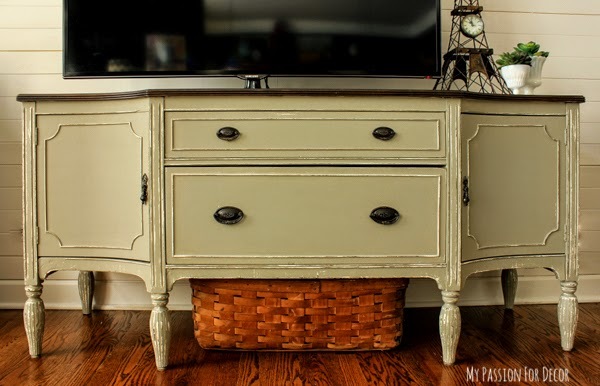 I'm a sucker for great legs on a piece of furniture and I love the legs on this buffet. There you have it! A quick and easy update for an already existing piece, no moving required! I was going to move the TV for pictures, but the hubby wasn't home and there's no way I could move that beast on my own. 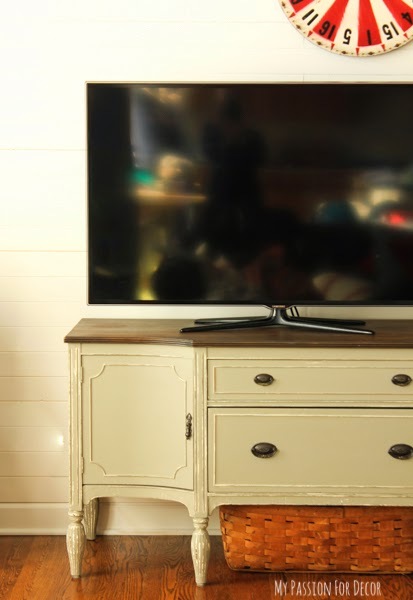 Why hide the TV, when this is a media cabinet anyway? Right? I like to use furniture pieces fun ways. 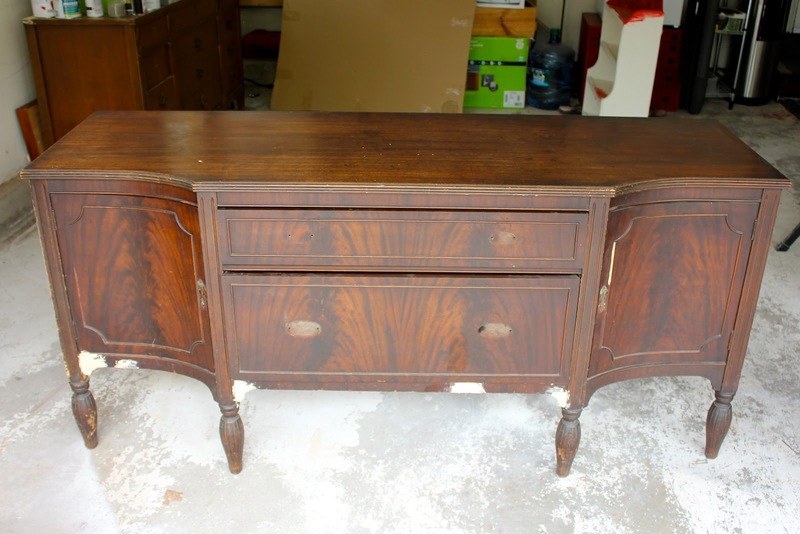 This is a perfect example of this...this is a buffet once used in a dining room. 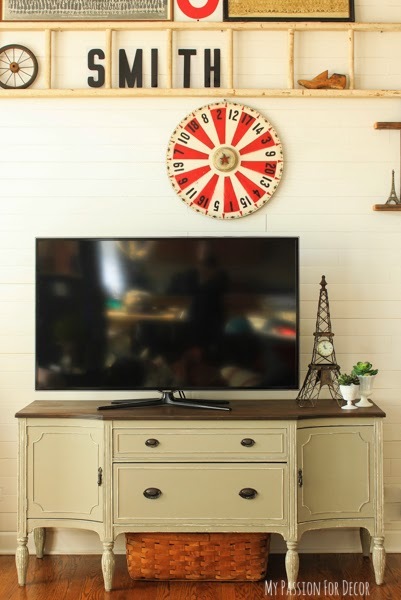 I like it as a media cabinet. It's wonderful to have storage for miscellaneous TV related items. 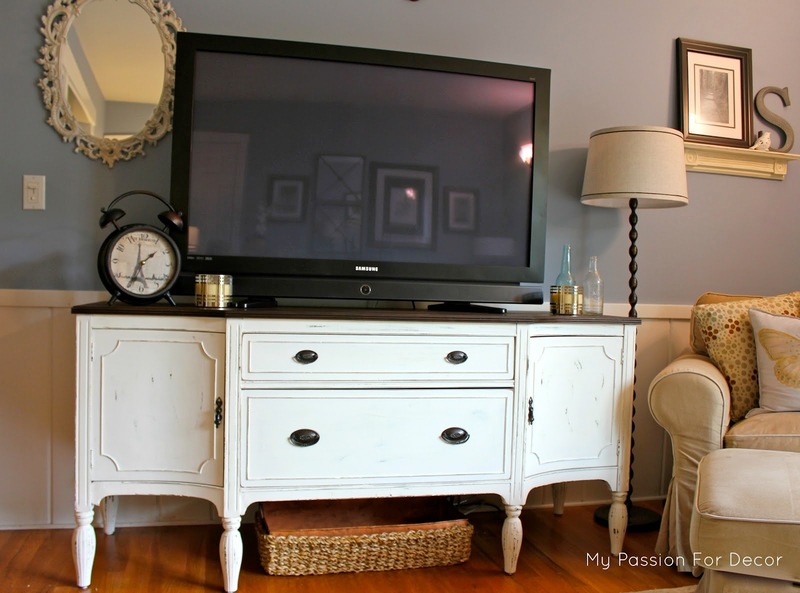 How about you, do you like to use furniture the way it was intended to be used? Or do you like to switch it up a bit and doing something fun and unexpected? I'm happy to be back sharing with you and can't wait to see what 2015 has to offer!!! 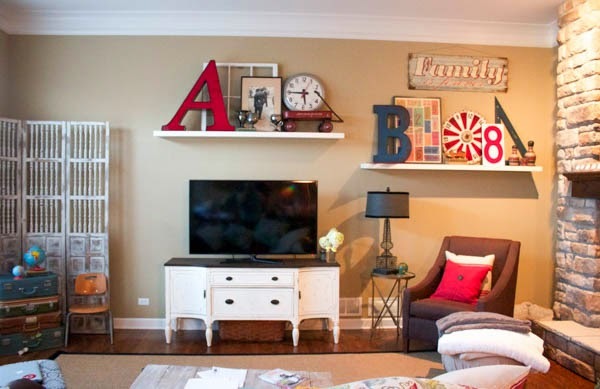 It looks fabulous and I love love love your Decor. I know I say it everytime. But I really really do! Is nice to have you back in the bloggy world. I missed seeing what fun things you were creating! Thank you Karin!! I'm glad to be back! Be~YOU~tiful Link Party And Features!